The Minto Cultural Roundtable is excited to announce a diverse, cultural line up of events for 2018 Culture Days on September 28, 29 and 30, 2018! Ontario Culture Days is an annual three-day event featuring engaging community arts activities. Since its inaugural year in 2010, Ontario Culture Days has featured over 10,800 free arts and cultural heritage activities in all disciplines in Ontario as a part of the national Culture Days celebration, the largest public participation campaign undertaken by the Canadian arts and cultural community. Beginning the last Friday of September, the annual Culture Days weekend features hands-on, behind-the-scenes, community-engaged activities inviting the public to contribute to arts and culture across Canada. The Minto Cultural Roundtable has organized a weekend filled with various workshops such as World Music, Musical and Masquerade Make-and-Takes, Yoga for Warriors and more will be available to attend at Wellington County Library branches in Minto. 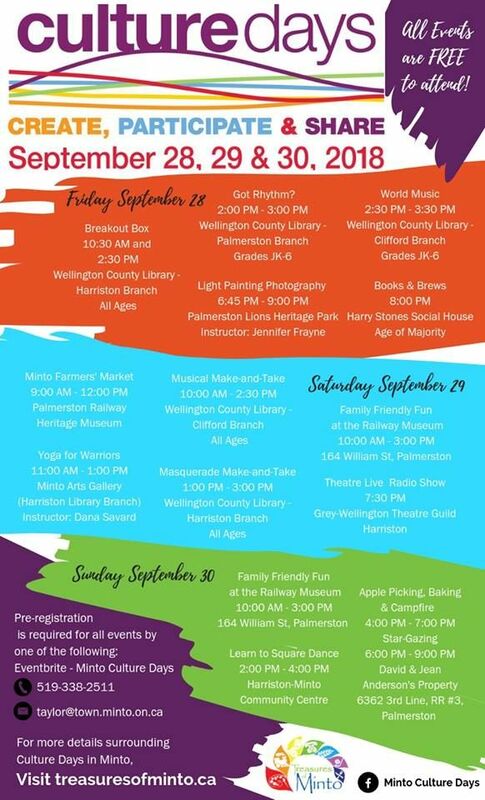 There will also be apple picking, a Books and Brews event at Harry Stones Social House, Light Painting Photography with Jennifer Frayne Photography, Family Fun at the Palmerston Railway Heritage Museum, a Theatre Live Radio Show, a square-dancing workshop, and more! Better yet, all the events are free!